Trade Secrets "The Export Answer Book"
Small and medium sized exporters, irrespective of their geographical location are confronted with similar questions about the export procedures. These questions need to be answered for an SME to export successfully. SMEDA has taken up the task to develop guidelines, which will help Pakistani SMEs to successfully enter into the world market.
" 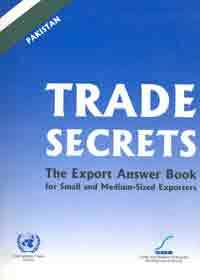 Trade Secrets- The export answer book for small and medium sized exporters" is a joint publication of SMEDA and the ITC (International Trade Center). It is based on a generic version prepared by ITC and has been customized under ITC guidance by SMEDA to meet the needs of the existing and potential exporters in Pakistan. This handbook is the result of extensive interaction with a large number of small and medium sized industries, export houses, educational institutions, libraries, relevant government departments and other organizations. A national level survey was carried out and focus groups were held throughout the country, to gather information on most frequently asked questions by the exporters. The research and compilation of factual details and in-country resources was then finalized by SMEDA. Trade Secrets is primarily a reference book for small and medium sized exporters, which provides a comprehensive overview of the export process and practical information on aspects of export operations such as standard practices, procedures, sources of assistance and supplementary material. Using a question answer format, this book features 126 most frequently asked questions regarding the export process for which answers are not easily found. The resources, which accompany each question and answer, will enable the reader to delve deeper into a particular topic.